For the American soccer goalkeeper, see Mickey Cohen (soccer). Mickey Cohen was born on September 4, 1913, into an Orthodox Jewish family living in the Jewish Brownsville section of Brooklyn. His mother Fanny, who had become widowed in September 1914, had emigrated from Kiev, Ukraine. Soon, however, Fanny moved her family to the Boyle Heights neighborhood of Los Angeles. At age 6, Mickey was selling newspapers on the street; one of his brothers, Louie or Harry, would drop him off at his regular corner, Soto and Brooklyn Streets (now Cesar E. Chavez Avenue). In 1922, petty crime landed Mickey in reform school. As a teenager, Cohen began boxing in illegal prizefights in Los Angeles. In 1929, the 15-year-old moved from Los Angeles to Cleveland, Ohio, to train as a professional boxer. His first professional boxing match was on April 8, 1930, against Patsy Farr in Cleveland. It was one of the preliminary fights on the card for the Paul Pirrone/Jimmy Goodrich feature bout. On April 11, 1933, Cohen fought against Chalky Wright in Los Angeles. Wright won the match, and Mickey was incorrectly identified as "Mickey Cohen from Denver, Colorado" in the Los Angeles Times sports page report. His last fight was on May 14, 1933, against Baby Arizmendi in Tijuana, Mexico. In a match on June 12, 1931, Cohen fought and lost against World Featherweight Champion Tommy Paul, having been knocked out cold after 2:20 into the first round. It was during this round he earned the moniker "Gangster Mickey Cohen". In Cleveland, Cohen met Lou Rothkopf, a member of Moe Dalitz's outfit. Cohen later moved to New York, where he became an associate of labor racketeer Johnny Dio's brother, Tommy Dioguardi, and with Owney Madden. Finally, Cohen went to Chicago, where he ran a gambling operation for the Chicago Outfit, Al Capone's powerful criminal organization. The Chicago Outfit is an American Mafia organization from Chicago. It has a long and extensive history dating from long before the reclamation. The Outfit is the only independent Mafia organization that is not controlled by the "Five Families" of La Cosa Nostra from New York. section|date=September 2015}} During Prohibition, Cohen moved to Chicago and became involved in organized crime, working as an enforcer for the Chicago Outfit, where he briefly met Al Capone. During this period Cohen was arrested for his role in the deaths of several gangsters in a card game that went wrong. After a brief time in prison, Cohen was released and began running card games and other illegal gambling operations. He later became an associate of Capone's younger brother, Mattie Capone. While working for Jake Guzik, Cohen was forced to flee Chicago after an argument with a rival gambler. In Cleveland, Cohen again worked for Lou Rothkopf, an associate of Meyer Lansky and Benjamin "Bugsy" Siegel. However, there was little work available for Cohen in Cleveland, so Lansky and Rothkopf arranged for him to work with Siegel in Los Angeles. In 1939, Cohen arrived in Los Angeles to work under "Bugsy" Siegel. During their association, Cohen helped set up the Flamingo Hotel in Las Vegas and ran its sports book operation. He also was instrumental in setting up the race wire, which was essential to Vegas betting. During this time, Cohen met prostitute Lavon Weaver (working alias Simoni King), and the couple married in 1940. In 1947, the crime families ordered the murder of Siegel due to his mismanagement of the Flamingo Hotel, most likely because Siegel or his girlfriend Virginia Hill were skimming money. According to one account which does not appear in newspapers, Cohen reacted violently to Siegel's murder. Entering the Hotel Roosevelt, where he believed the killers were staying, Cohen fired rounds from his two .45 caliber semi-automatic handguns into the lobby ceiling and demanded that the assassins meet him outside in 10 minutes. However, no one appeared, and Cohen was forced to flee when the police arrived. Cohen's violent methods came to the attention of state and federal authorities investigating Jack Dragna's operations. During this time, Cohen faced many attempts on his life, including the bombing of his home on posh Moreno Avenue in Brentwood. Cohen soon converted his house into a fortress, installing floodlights, alarm systems, and a well-equipped arsenal kept, as he often joked, next to his 200 tailor-made suits. Cohen briefly hired bodyguard Johnny Stompanato before Stompanato was killed by Cheryl Crane, the daughter of actress Lana Turner. Cohen bought a cheap coffin for Stompanato's funeral and then gave Turner's love letters to Stompanato to the press. In 1950, Cohen was investigated along with numerous other underworld figures by a U.S. Senate committee known as the Kefauver Commission. As a result of this investigation, Cohen was convicted of tax evasion in June 1951 and sentenced to prison for four years. In Ben Hecht's autobiography, A Child of the Century, he says that Cohen called him to say he wanted to do his part in helping Hecht raise money to support Menachem Begin's Irgun in its fight for Israel's independence. Cohen called together a parlor meeting of people who did business with him and had Hecht address them on the importance of the cause. Each person was then asked to call out a sum he would donate. In some cases, Cohen told a donor "that's not enough" and they upped the pledge. Later, when Cohen was arrested, he called Hecht from prison to ask if he had access to some cash to help with his bail. When Hecht apologized, Cohen politely said goodbye, and they never spoke again. When he was released in October 1955, he became an international celebrity. He ran floral shops, paint stores, nightclubs, casinos, gas stations, a men's haberdashery, and even drove an ice cream van on San Vicente Boulevard in the Brentwood section of Los Angeles, according to author Richard Lamparski. In 1957, TIME magazine wrote a brief article about Cohen's meeting with Billy Graham. Cohen said, "I am very high on the Christian way of life. Billy came up, and before we had food he said—What do you call it, that thing they say before food? Grace? Yeah, grace. Then we talked a lot about Christianity and stuff." Allegedly when Cohen did not change his lifestyle, he was confronted by some Christian acquaintances. His response: "Christian football players, Christian cowboys, Christian politicians; why not a Christian gangster?" In 1961, Cohen was again convicted of tax evasion and sent to Alcatraz. He was the only prisoner ever bailed out of Alcatraz; his bond was signed by U.S. Supreme Court Chief Justice Earl Warren. After his appeals failed, Cohen was sent to a federal prison in Atlanta, Georgia. His heavily armored Cadillac from this period was confiscated by the Los Angeles Police Department and is now on display at the Southward Car Museum in New Zealand. On August 14, 1963, during his time at the Atlanta Federal Penitentiary, inmate Burl Estes McDonald attempted to kill Cohen with a lead pipe. In 1972, Cohen was released from the Atlanta Federal Penitentiary, where he had spoken out against prison abuse. He had been misdiagnosed with an ulcer, which turned out to be stomach cancer. After undergoing surgery, he continued touring the United States and made television appearances, once with Ramsey Clark. Cohen, who was 62, died of stomach cancer in his sleep in 1976 and is interred in the Hillside Memorial Park Cemetery in Culver City, California. In the film Bugsy (1991), Mickey Cohen is portrayed by actor Harvey Keitel. Keitel received an Oscar nomination for Best Supporting Actor. 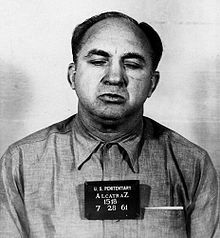 In the film So I Married an Axe Murderer (1993), Mickey Cohen is mentioned as being a past inmate at Alcatraz. In the film L.A. Confidential (1997), loosely based on James Ellroy's 1990 novel, Mickey Cohen is portrayed by actor Paul Guilfoyle in a bit part but is a major influence throughout the rest of the movie. In the film The Black Dahlia (2006), Mickey Cohen is mentioned as being an illegal bookmaker taking bets on an underground boxing match. In the film Gangster Squad (2013), Cohen is portrayed by actor Sean Penn and is the main antagonist of the film. The movie is a fictionalized version of Cohen's downfall, as it shows Cohen being taken down for personally murdering one of his subordinates, when he was actually imprisoned for tax evasion. Patrick Fischler lends his voice and likeness to play Mickey Cohen in the 2011 video game L.A. Noire (set in 1947), who is involved in a few cases while working the Vice desk. In James Ellroy's L.A. Quartet book series, Cohen plays a major supporting role in three of the novels: The Big Nowhere (1988), L.A. Confidential (1990) and White Jazz (1992). In retired newspaperman Howard Scott Williams' 2017 memoir The Gangster's Butler, recounting stories he reported on from 1948 to 1976, he recounts posing as a butler for Cohen in order get information for a story. In Frank Darabont's television series Mob City, Cohen is portrayed by Jeremy Luke. ^ "Mickey Cohen at Alcatraz". Alcatraz History. Retrieved 2019-02-02. ^ Jay Robert Nash (1995). Bloodletters and Badmen. M. Evans and Company. p. 150. ISBN 9780871317773. What particularly enraged Cohen was that Turner refused to pay for her ex-lover's funeral and Cohen had to foot the bill. He bought a cheap wooden coffin for Stompanato. Then, he vindictively gave the press Turner's love letters to Stompanato. ^ "People, Apr. 15, 1957". Time. April 15, 1957. ^ "Cadillac Gangster 1950". Los Angeles Times. November 18, 2007. Retrieved 2012-05-25. ^ "L.A. Noire Has A Star Studded Cast Of Whatstheirnames. |". Hmsfriday.com. 2011-03-10. Retrieved 2014-01-15. ^ Amazon staff. "Howard Scott Williams, The Gangster's Butler". Amazon Books. Retrieved 2019-02-02. F. Murray, "The Charmed Life of M. Cohen", Front Page Detective, 1966, 30(3):44–45, 63. Lewis, Brad. Hollywood's Celebrity Gangster: The Incredible Life and Times of Mickey Cohen (New York: Enigma Books, 2007) ISBN 1929631650, ISBN 9781929631650. Buntin, John (2009). L.A. Noir: The Struggle for the Soul of America's Most Seductive City. New York: Harmony Books. ISBN 9780307352071. OCLC 431334523. Retrieved 8 October 2014. "Mickey Cohen". Find a Grave. Retrieved June 11, 2013.